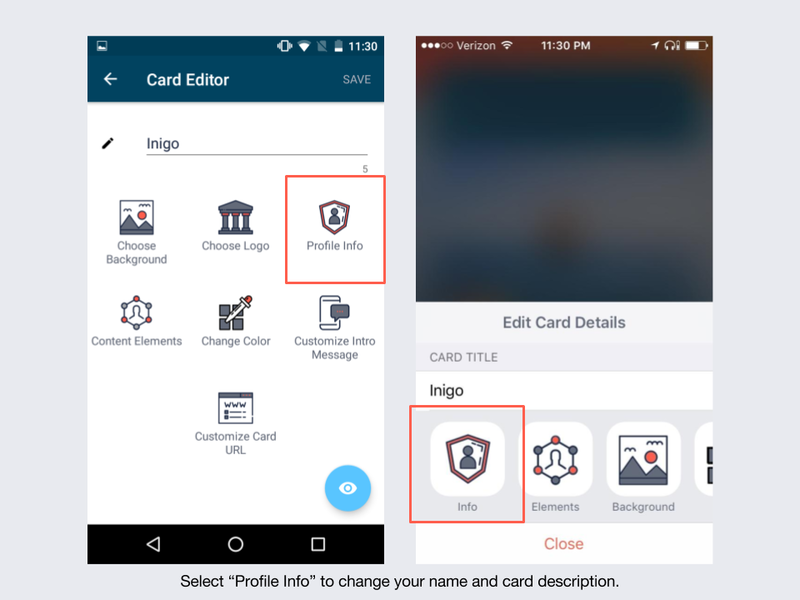 These steps will help you add an avatar, background image, name, and description for your first card. 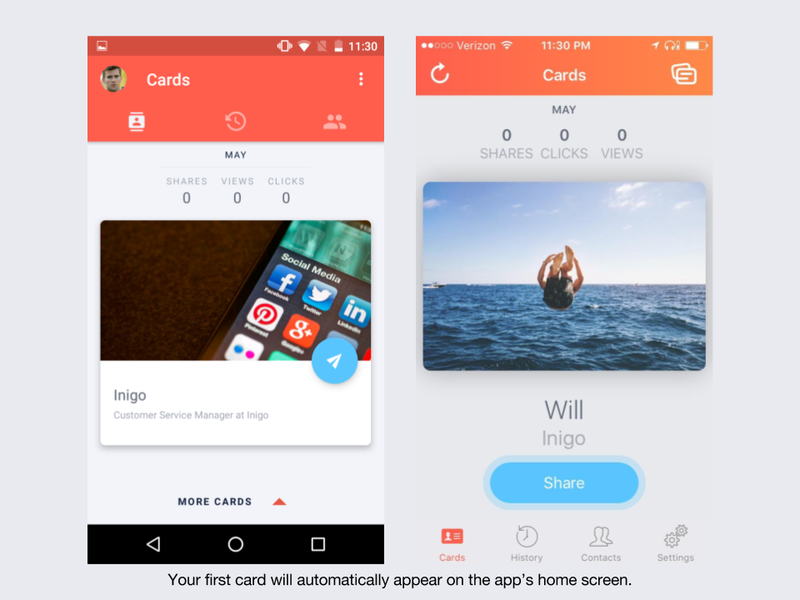 Your first card will automatically be created when you sign up for an account. This card will contain the information that you used when logging in, such as name and email address. You will want to add some details like an avatar, background image, card title, and description. We will add details for advanced editing later, but first, let's add some basics. To get started, please click on the pencil button in the bottom right hand of your card screen. For iOS users, please click the "edit" button on the bottom of the card. Your card title is important for branding, as it will tell recipients what your card is about! At the top of the card editor page, you will see a line of text with your card title. If this is a new card, it will just say "new." Please edit the text and click save in the top right for Android users, and "close" for iOS users. On Android, click the blue view button in the bottom right-hand corner to see the new card title on your card. You may notice that if you signed up for Inigo using a social media account, your avatar has been pulled from that sources profile image. This can be updated at any time, so do not worry if it is not the image that you would have chosen. To add a new image, open the card editor by clicking the pencil button in the bottom right hand of your card screen. You will see many options for editing, but please click profile info to change your avatar. This screen will open basic profile details. 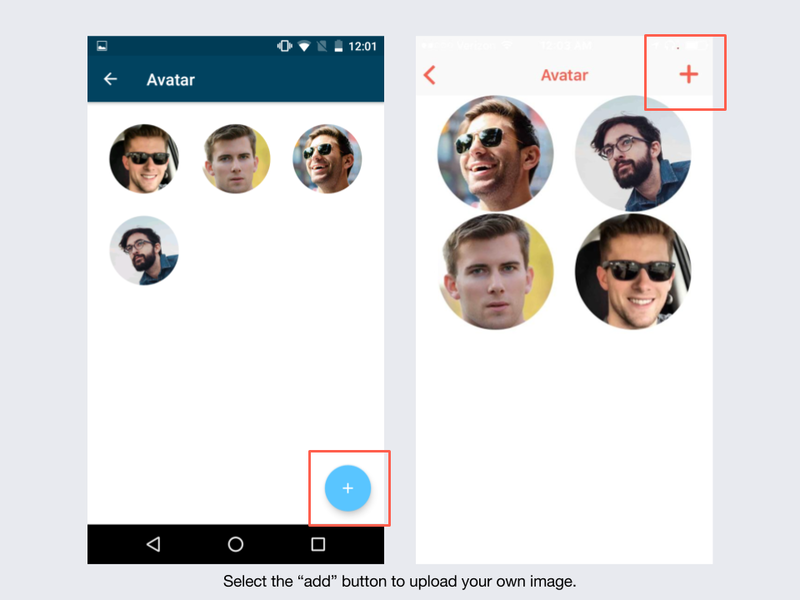 Click on the circular image in the center of the screen to open options for adding an avatar. 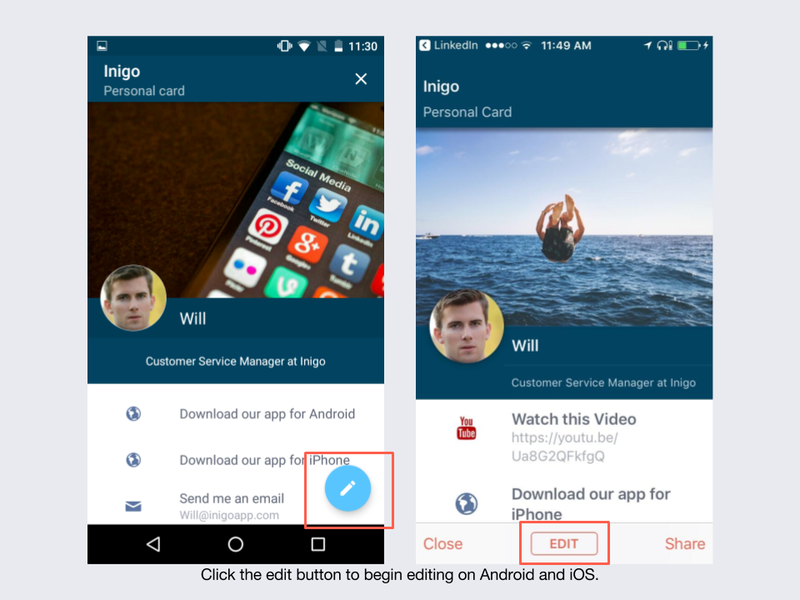 For iOS users, please click "edit" under the image icon. If you would like to add your own image, please click the + button in the bottom right-hand corner. You may be prompted to allow Inigo permission to access your photos, click yes to move forward. 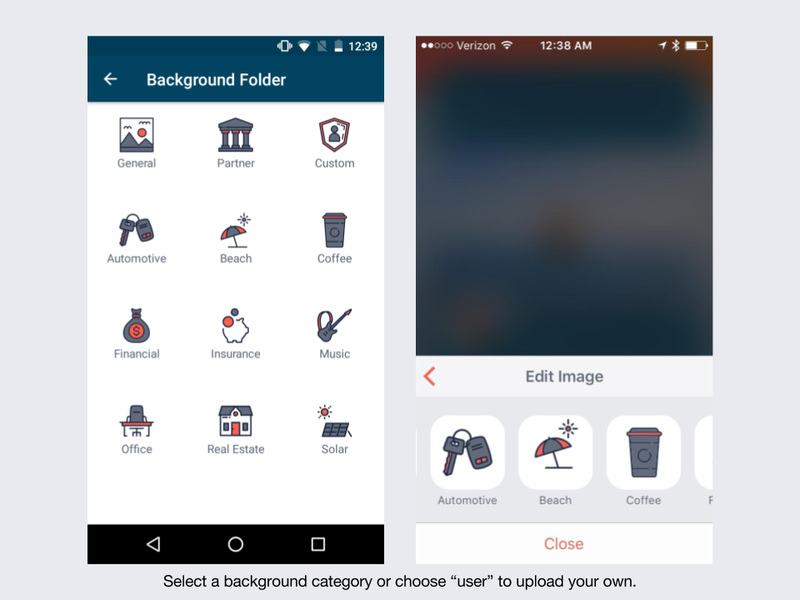 From this screen, you will be able to choose a photo from your gallery. Once you select one, you will see the image enlarge and a cropping tool will appear over the image. 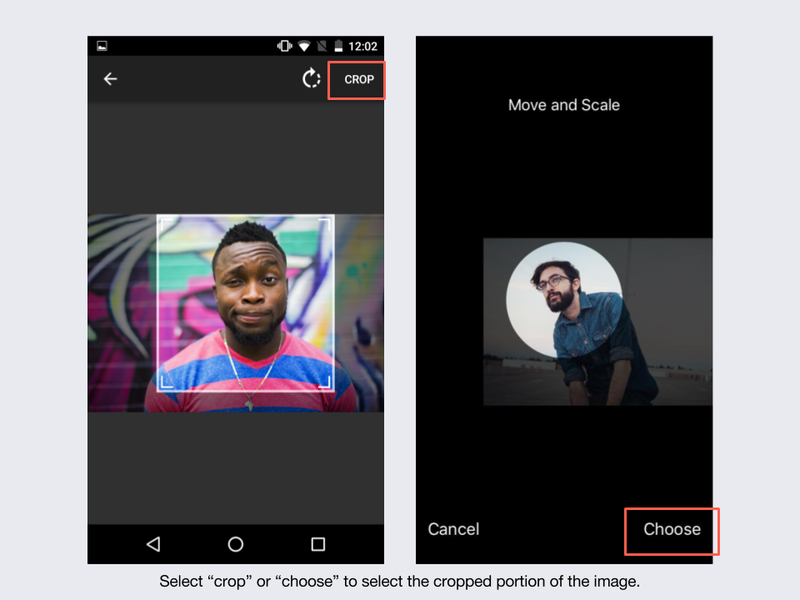 Make sure that your image is centered over the desired portion of the photo before clicking crop. 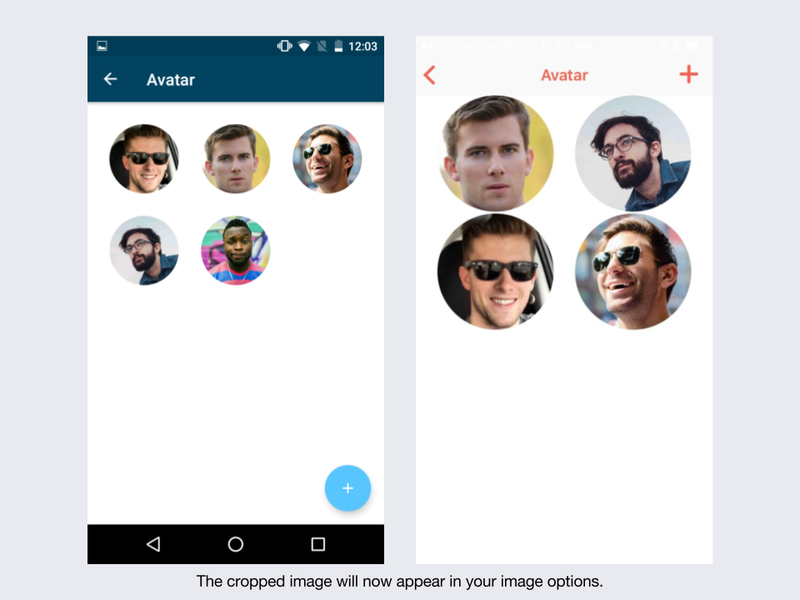 This selection will now be available in the "Avatar" page. Please click the image in order to select it as your avatar. You can also edit the avatar size as it will appear on your card. To choose a background image, please open your card and click the pencil button in the bottom right hand of your card screen. You will be taken back to the Card Editor page. Please select "Choose Background" on the top left. On this page, you will see several folders containing different sets of images. You can choose to pick an image based on your profession or goal for the card's usage. You can also upload your own image. Once you click a folder and choose an image you will be redirected to your business card and the new background image will appear. 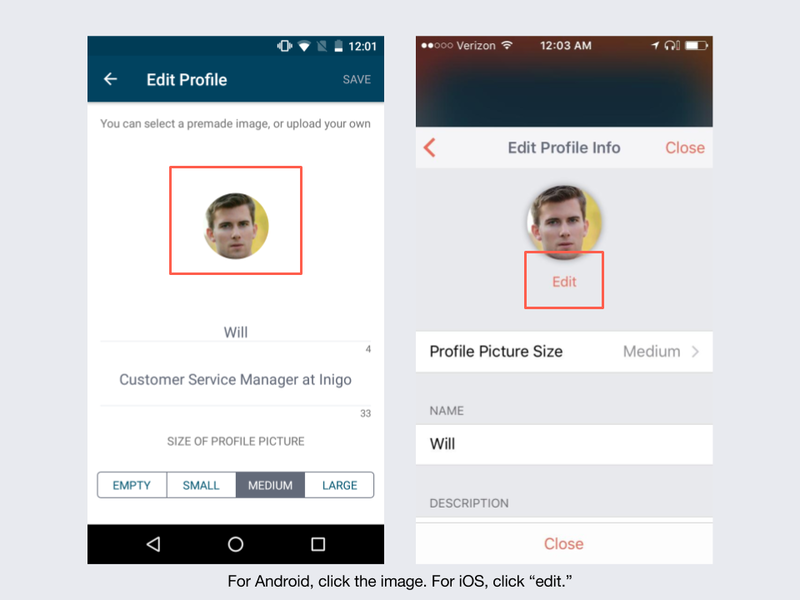 TIP: For information on adding a custom background, please read this article. To edit your name and card description, please go to your card and click the pencil button on the bottom right-hand side to open the "card editor page." From here, please click "profile info." Under your avatar, you will see your name as it appears on this card. Please edit this if you would like to. Remember that you can change your name for each card, but they will automatically contain the name that you used when signing up. Below the name field is a placeholder for your card description. You can use this space to enter information about your job, such as a title or description. You can also use this space to share information for your recipients about sales, deals, or updates. Users have done many creative things with this field, just remember that the character limit is 250. For advanced editing information, like adding your own background image, please click here.